In October 2016, Little Valley, Nevada, embers from a controlled burn set 10 days earlier in timber above Washoe Valley sparked and flared in the wind. “Smoke rose from the site, prompting a call to 911 that was dismissed as unfounded. Twelve minutes later, a second 911 call brought firefighters out. By the time they reached the burn site, the blaze had grown to at least 5 acres and was spreading fast. One of the conclusions was that the Nevada Department of Forestry, NDF, failed to adequately monitor the burn site. The NDF simply put, did not have the resources in place to monitor a 250-acre prescribed burn site. The day before the winds picked up and reignited the fire, NDF reported to have had five people on site for mop-up. Mop-up is the term used to describe the extinguishing of the fire where needed. Mop-up is usually done around the perimeter of the prescribed fire to keep it contained and controlled. Active patrol of the control lines (fire edge) will continue until the prescribed fire is completely out. After that periodic patrol will continue to ensure no latent smoke and/or heat is detected. Five people watching the perimeter of 250 acres was obviously not enough, also because hotspots are not necessarily visible to the naked eye, the heat lingering below the surface of the ground will go undetected. Could a drone have made a difference? We looked at this tragic event purely from a technical perspective, and asked ourselves “Could our system have made a difference?”. Being a user of fixed wing UAVs and having both thermal and calibrated thermal sensors in our portfolio, we believe the answer to be; Yes, it could! Controlled fire can be a tool for foresters, and stimulates the germination of some desirable forest trees, and reveals soil mineral layers which increases seedling vitality, thus renewing the forest. Hazard reduction or controlled burning is conducted during the cooler months to reduce fuel buildup and decrease the likelihood of serious hotter fires. Back burning involves starting small fires along a manmade or natural firebreak in front of a main fire front. Back burning reduces the amount of fuel that’s available to the main fire by the time that it reaches the burnt area. A wildfire is a fire in an area of combustible vegetation, and can be characterized in terms of the cause of ignition, their physical properties, the combustible material present, and the effect of weather on the fire. In industrialized countries, controlled burning is usually overseen by fire control authorities for regulations and permits. The party responsible must delineate the intended time and place. Obtaining a permit may not limit liability if the fire burns out of control. There are two basic causes of forest fires. One is natural (lightning) and the other is people. Controlled burns have a long history in forest management. Back burning is utilized in controlled burning and during wildfire events. While controlled burns utilize back burning during planned fire events to create a “black line”, back burning or backfiring is also done to stop a wildfire that is already in progress. Firebreaks are also often used as an anchor point to start a line of fires along natural or manmade features such as a river, road or a bulldozed clearing. It is called back burning because the small fires are designed to ‘burn back towards the main fire front’ and are usually burning and traveling against ground level winds. In the event of a wildfire or a controlled burn, information is critical for fire management and suppression. 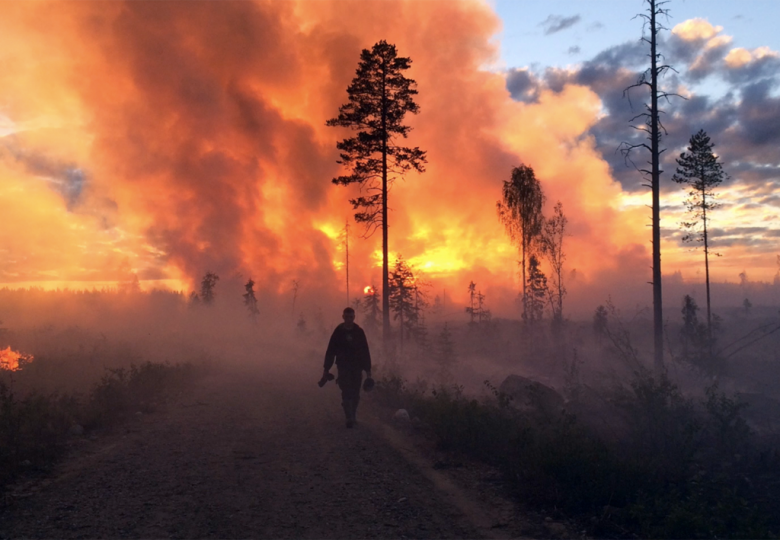 The scientists at the Ljungberg lab at the Swedish University of Agricultural Sciences in Umeå did a two-day field excursion to test thermal cameras in drones, joining the students at the fire management course at the forest faculty, who were going to do a prescribed burn of a 40-acre clear-cut. The scientists wanted to test their fixed wing UAVs and their multirotor drone to capture thermal images and video. The fixed wing equipped with a thermal camera is a powerful tool to collect information both during and after a fire. With the thermal camera, you can see the location of the fire through the smoke, but also the location and intensity of hotspots, helping the decision makers direct the firefighting activities. After the fire, it is a very efficient way to find hotspots that might cause the wildfire to rekindle. A fixed wing will cover up to 450 acres in one flight with the duration of 1 hour 40 minutes. And we are here not only speaking of a perimeter search, we are speaking of the entire burn area. You can find the scientist’s short, but very enlightening, video here.